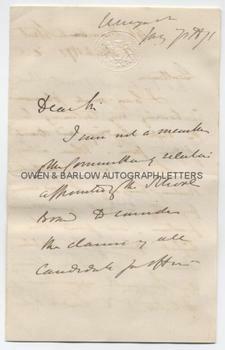 THOMAS HENRY HUXLEY autograph letter Signed. British (English) biologist, comparative anatomist and Charles Darwin's principal supporter. ALS. 2pp plus integral blank leaf. The Geographical Survey of England and Wales. July 7th 1871. To E[dmund] K[ell] Blyth. "I am not a member of the Committee of selection appointed by the School Board to consider the claims of all candidates further but I cannot doubt that your application will receive full and fair consideration." [etc]. 8vo. Approx 7 x 4.5 inches. Mounting traces to verso of integral blank leaf, else fine. Thomas Henry Huxley was one of the leading biologists and scientists in Britain during the 19th century. As a young ship's doctor, he sailed on HMS Rattlesnake's voyage of exploration to New Guinea and Australia. As a result of his paper on the marine invertebrates encountered on the voyage, Thomas Henry Huxley was elected a Fellow of the Royal Society at the age of only 26 and embarked on a career as an eminent biologist and comparative anatomist. He is, perhaps, best known today for his staunch support and defence of Darwin and his theory of evolution and for his famous debate with Samuel Wilberforce on this subject. 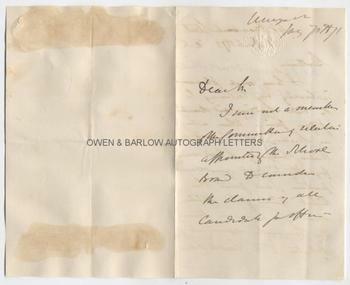 At the date of this letter Thomas Henry Huxley had been serving on numerous Royal Commissions and committees and was a member of the newly constituted London School Board. Huxley did more than anyone to ensure that science was recognised as a valid subject to be taught in schools and universities. Thomas Henry Huxley became president of the Royal Society in 1883. 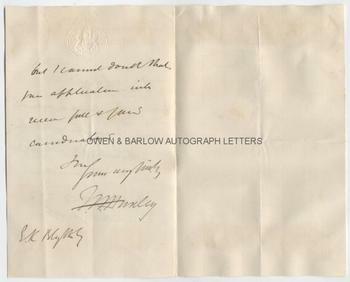 Provenance: From a 19th century album compiled by the Blyth family. Edmund Kell Blyth was a London Solicitor and author of a biography of William Ellis, founder of the Birkbeck Schools.